Former Prime Minister Manmohan Singh criticised the culture of constant self-praise and PM’s jumlas. Two days after he performed the headline-grabbing ‘unscripted’ hug on Prime Minister Narendra Modi in the Lok Sabha, Congress President Rahul Gandhi accused the Bharatiya Janata Party (BJP) of ignoring the plight of the poor and urged party workers to “rise and fight for India’s oppressed”. Chairing the first meeting of the newly-constituted Congress Working Committee (CWC) after becoming the party chief, Gandhi said that the CWC is a “bridge between the past, present and the future”. 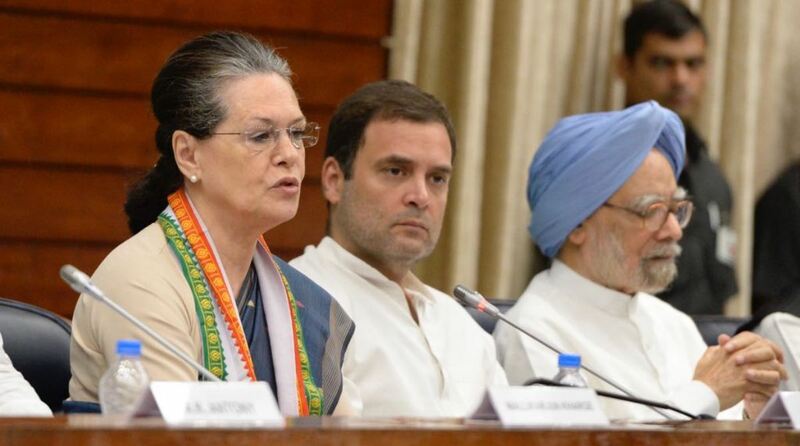 At the meeting, held at Parliament House Annexe, Gandhi said that the Congress is the “voice of India”. Top Congress leaders, who were in attendance, said that alliances with other parties will have to be formed to take on the BJP in 2019. Former Prime Minister Manmohan Singh criticised the culture of constant self-praise and PM’s jumlas which have replaced solid policy framework for driving the engine of growth. He said that the government’s claim of doubling farm income by 2022 will require an agricultural growth rate of 14 per cent, “which is nowhere in sight”. In her address to the CWC, former party president Sonia Gandhi cautioned about the reign of despair and fear heaped upon India’s deprived and poor. “The increasing rhetoric in PM Modi’s speeches shows his desperation reflecting that reverse countdown of the Modi government has begun,” Congress spokesperson Randeep Surjewala tweeted quoting Sonia Gandhi. She said that there is need to protect “our people from a dangerous regime that is compromising the democracy of India”. “We are committed to making alliances work and we are all with him (Rahul Gandhi) in this endeavour,” she said. Other Congress leaders, too, extended their support to the 48-year-old Rahul Gandhi. On 17 July, Gandhi constituted the CWC by appointing 23 members and dropping some senior leaders in a bid to strike a balance between age and experience and prepare for the 2019 Lok Sabha polls. Prominent among those dropped from the previous CWC include Digvijay Singh, Janardan Dwivedi, Kamal Nath, Sushilkumar Shinde, Punjab Chief Minister Capt. Amarinder Singh and former Haryana Chief Minister Bhupinder Singh Hooda. CP Joshi, BK Hariprasad, Karan Singh, Oscar Fernandes, Mohan Prakash, Hemo Prova Saikia and Sushila Tiriya have also been dropped. The leaders who have been retained include Ghulam Nabi Azad, Ahmed Patel, Mallikarjun Kharge, Ashok Gehlot, Motilal Vora, AK Antony, Amika Soni, Anand Sharma, Mukul Wasnik, Avinash Pande, KC Venugopal and Dipak Babaria.